Today & Tomorrow! Bazaar Bizarre San Francisco! We are here in San Francisco! Heather and I will be bleary eyed but ready to vend at Bazaar Bizarre today and tomorrow at Booth #229 (I think). A bonus gift! I hear the first purchase made at BazBizSF with your Square Wallet will come with $10 off a purchase of $25 or more. 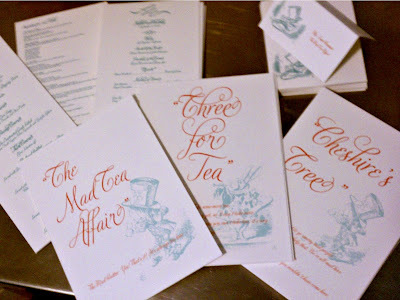 OH and we have free (FREE) letterpress remnants (bookmarks, scrapbook fun?) and mention this blog post for FREE GIFT WITH PURCHASE. Los Angeles Printer's Fair This Saturday! OK so this is the 3rd time Joie Studio will be participating in the Los Angeles Printers Fair. 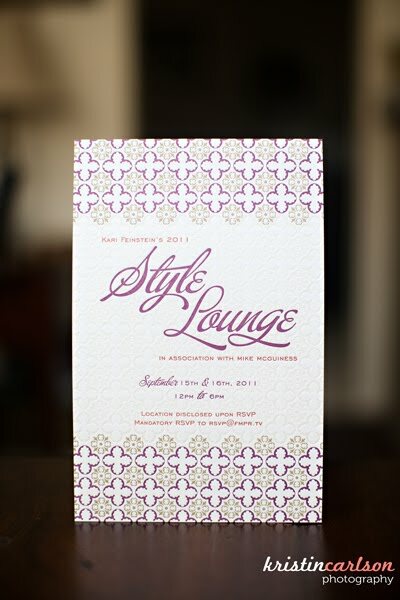 We always have a lot of fun at this event, especially since we not only sell a sampling of our letterpress papergoods, we also bring a bunch of letterpress supplies and have sort of a mini garage sale on envelopes, paper, and other doodads and knick-knacks. So come on out to Carson on Saturday! Say hi! Oh, and I'll have a little gift item for you if you show me that you follow Joie Studio on Twitter or Facebook. So easy-peasy. Come, "like" or "follow" Joie Studio, and get a little love from us! I so loved doing the split fountain the other day on the calendar cover that I decided to make them into cards. You likey? I likey! 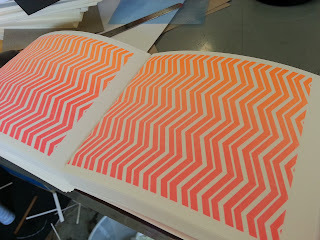 Split fountain for the back pattern...next step after they dry to is to letterpress the greeting onto it. I'm chugging along printing a bunch of new card designs. More soon! Can you spot the table cards and one or two menus? Sorry for the cell phone pictures! One of these days I'll lug out the SLR and take better pictures! 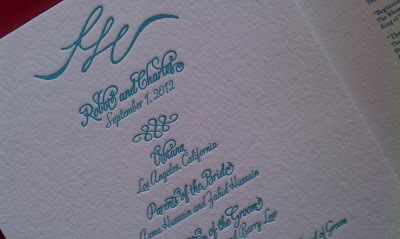 Congratulations to Robbi & Charles! 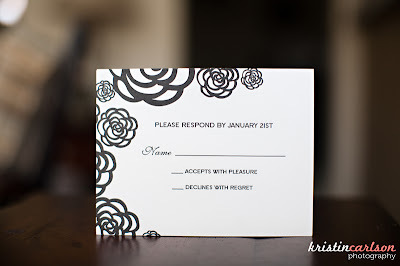 I'm hoping that the photographer took some awesome pictures of the wedding day stationery so we can see more details! Joie Studio's first ever split fountain!!! 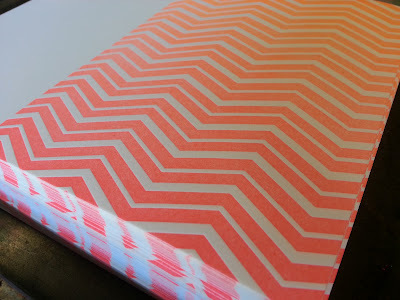 So we were printing our 2013 letterpress desk calendar and I thought the chevron pattern would look great as a split fountain. 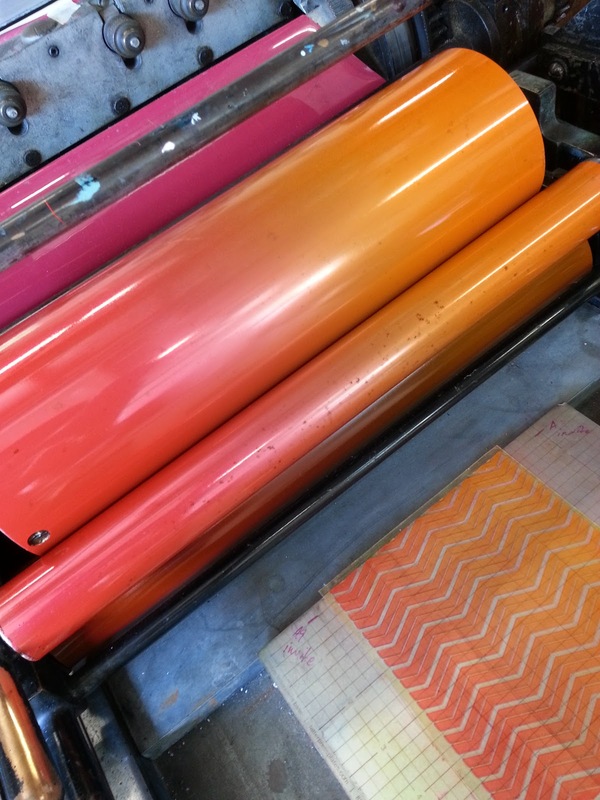 I had fluorescent orange on the press and decided add hot pink. I worked fast and got the whole run in with this split fountain, which I'm really happy about. The result on the press rather reminds me of a tequila sunrise...ah delicious! I love it so much I'm probably going to do a split fountain for two different greeting cards. Anyhow, here's a little sneak peek of our "Bright 2013" calendar! It'll be ready in time for the LA Printer's Fair! Or like the ones on her blog. 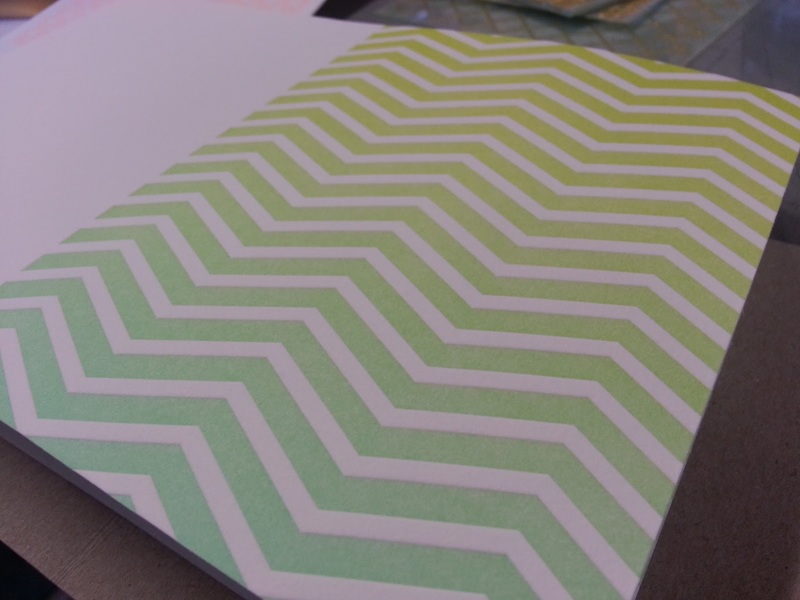 She was kind enough to share with me some photos she took of Joie Studio's work, too! 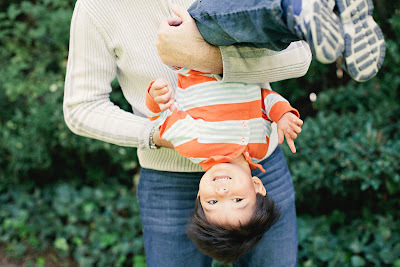 Kristin, I owe you majorly for capturing my family and my work so beautifully!